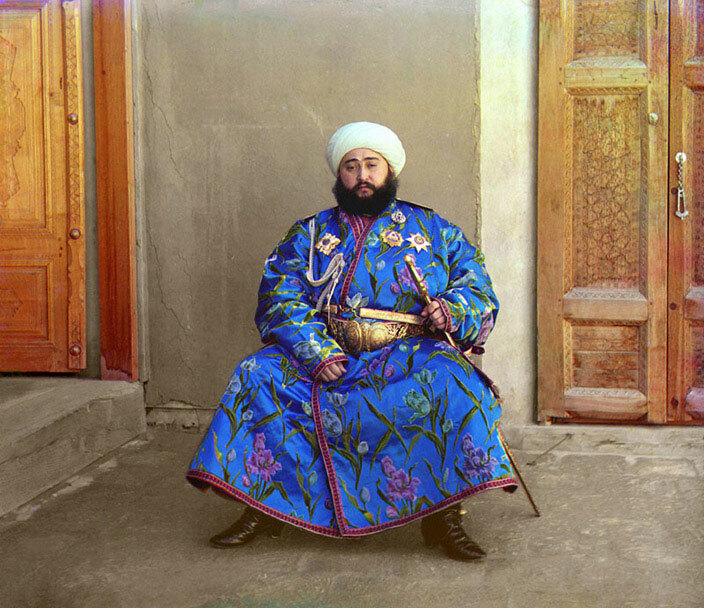 Meet Emir Said Mir Mohammed Alim Khan, the last emir of Bukhara. He looks rather splendid in his elaborate coat with its startling blue silk cloth with embroidered flowers and leaves. Then there’s the gold belt and, one suspects, quite functional sword. Above it all, however, rests the serene and confident visage of Alim Khan himself. He led an extraordinary life, and was the last direct descendant of Genghis Khan to rule a nation. I say “was” because this extraordinarily clear and colourful portrait we have of him was taken in 1911, when Alim Khan was around 30 years old. He had just taken over the reins of power following the death of his father the year before. The photograph was taken by Sergey Prokudin-Gorsky. With the support of Tsar Nicholas II, he spent six years travelling around the Russian Empire to document its people, its geography and its cultures. The US Library of Congress has a wonderful collection of Prokudin-Gorsky’s photographs. The latest were taken just after the start of WWI, and only two years before the revolution which ultimately deposed Alim Khan from his throne. Alim Khan died in Kabul, Afghanistan in 1944. His old emirate now lies within the borders of Uzbekistan, once part of the Soviet Union and now an independent republic.